Available in sedan and convertible bodystyles, the Chrysler Sebring comes powered by four- and six-cylinder engines. The convertible is available with a retractable hardtop. Changes to the Chrysler Sebring lineup are minor for 2010, and include a new hood design and a new instrument panel gauge cluster. All models also receive active headrests in front. The 2010 Chrysler Sebring Sedan is powered by a base 2.4-liter Inline-4 with 173 hp. Also available is a 3.5-liter V6 with 235 hp. 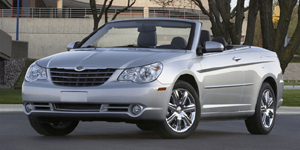 The 2010 Chrysler Sebring Convertible is powered by a base 2.4-liter Inline-4 with 173 hp. Other available engines include a 2.7-liter V6 with 186 hp and a 3.5-liter V6 with 235 hp. Find the used Chrysler Sebring of your choice from a dealer in your area. Search our used car listings now.